Coop member Farida Moultmar went to the fashion academy in Brussels and wanted to become a coupeuse for large fashion houses. After her arrival in the Netherlands, her life path has changed slightly. She now uses her talent to teach her skills to other local women and men. "There is hidden talent in every neighborhood," she says. Another talent is Bailey, who via the cooperative is active as a cleaner for SCHOON. Eutropian is an organization that supports and stimulates inclusive urban development. It is a European network of residents' organizations, municipalities, interest groups and other initiatives that focus on the sustainable strengthening of cities, cultural development, local economic development and the participation of residents. The Afrikaanderwijk Cooperative is member of this network and shares the knowledge and experience gained with other members. A report on the district-driven approach of the municipality of Rotterdam. The neighborhood concierge in Schiebroek and the cleaning of porches in the Afrikaander district are used as an example. The cooperative has a team of local cleaners who clean porches in the neighborhood and are also the eyes and ears of the neighborhood. Prime Minister Mark Rutte paid a visit to the Afrikaander district in 2016. He visited several coop members such as NIFFO, Rotterdams Munt, Wijkatelier op Zuid, Rotterdamsche Confituur, Broozz Streetwear and Borduur Deluxe. In the Gemaal op Zuid he met with local administrators, the Afrikaanderwijk Cooperative, Migrant Development Association and enjoyed the cooking skills of the Wijkkeuken van Zuid. Home for a moment is an international research project into the relationship between intimacy and space. The Korean artist Minsun Kim visualizes how people really want to live in different places around the world. In collaboration with the Afrikaanderwijk Cooperative she made a personal portrait from the Gemaal op Zuid about living in the Afrikaander district. In the summer of 2018 students of the Willem de Kooning Academy (Hogeschool Rotterdam) participated in the Neighborhood Kitchen (De Wijkkeuken van Zuid) as part of the course they followed, called New Earth. They started and ended their day on the well known Afrikaandermarket. 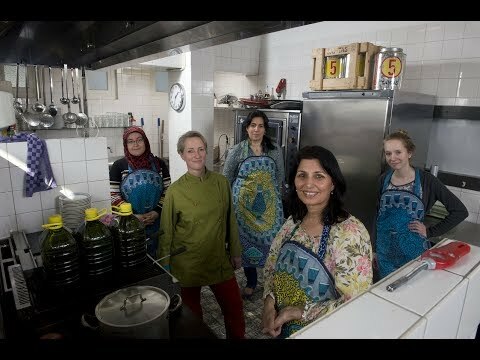 In the mean time they filmed a succesfull cooking workshop what resulted in this short film.